Over this Solstice time, I have been guided to unplug from the online world and allow myself to be pulled deep into the Winter Solstice dive. I have been sleeping (a lot), walking in nature, being invited by new neighbours and just “being” with my family. 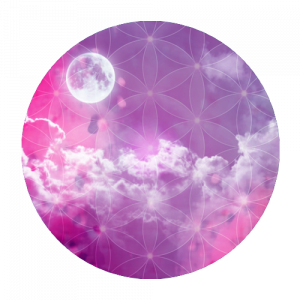 In the past few days, I have also been dreaming in what I wish for in 2016 and designing the Create a Magical Business Winter Planning with the Moon Session for New Moon in January. As with all rituals, before we bring in the new, we need to say goodbye and thank you to what has come before – so I have been reviewing with great love our 2015. Not a day goes by in my life that I don’t take or use a flower or vibrational essence in some way. 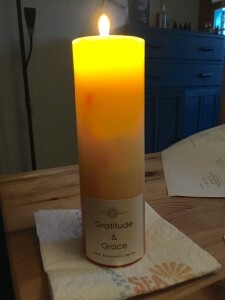 And as I write this blog, here are my writing allies – Wild Turkey Essence from the Wild Earth Animal Range and a beautiful Gratitude and Grace candle gifted to me by my publisher, Linda Joy. For those of you who do not know, this past year my family and I have realised a dream of over 20 years – that is relocating from the UK to France. We knew for many years that we were waiting for a “wave” and when that wave began to be visible on the horizon, we took all our courage and allowed ourselves to be carried to the next place. So here we are now in a very sweet rented cottage just outside Bordeaux, in South West France and new house-owners of a properly overlooking the Gironde estuary and moving we hope in March 2016. I have a huuuuge list of gratitudes for this year past and here I’d like to share with you 3 of them. The first I don’t have any photos of as it was a day of pure presence so I’ll share here a photo of our destination that day. It was the day we left our house of 28 years in the UK and drove (with our 2 cats) to France. The Universe had decided it was to be June 21st – our longest day and the only day we could buy tickets for the Channel Tunnel. It was a day of taking our courage and just “walking” out of the house we loved so much and who had kept us all safe for many years, putting our few kept possessions in our van and literally driving away. 14 hours later we arrived at our cottage – just as the sun set and our new life began. On the drive our cats slept and were extraordinarily settled, we laughed and dreamt and as we arrived in the hamlet where we live, we saw wild deer playing. 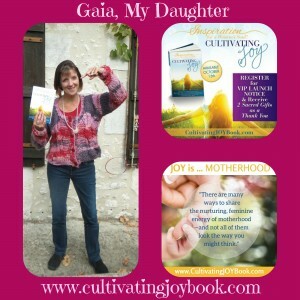 The second gratitude of 2015 was a very emotional launch of my very first book Cultivating Joy. 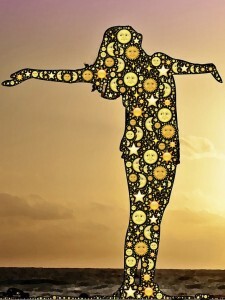 Earlier in 2015 I had made the decision to take part in a co-authored book of women sharing how they had transformed a life challenge into joy. At the time of agreeing to take part, I had no idea of what I would share yet had always wanted to be a published author. 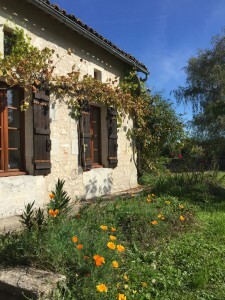 Divine timing allowed my sharing to be written from our new cottage in France and to be a love story around the conception of our daughter “Gaia” and how the grief around her miscarriage transformed into a doorway of new life and potential. Little did I know at the time just how emotional the launch of the book would be for me – and the beauty I felt and tears I shed as I shared for the first time the story of our daughter in spirit and all she gifted us. It’s an experience I highly recommend – allowing yourself to be vulnerable enough to share the depths of your heart. It was very very healing and I felt as if I “grew up” at that moment. The book went on to be a best-seller and can still be bought now if you feel guided to read these beautiful stories. My third sharing and acknowledgment of gratitude is to the extraordinary support that modern technology now offers us as small business owners. Over 5 years ago, when we first began planning our relocation seriously, I was guided to create a Practitioner Diploma in Flower and Vibrational Medicine. It was a project that turned out to be a divine channel that created itself rather magically. One of the aspects of this Diploma that made itself known to me right from the outset was that it needed to be online and that as we moved, “it” needed to be able to move with us. And as we relocated this year, all systems were set up to either 1) support participants whether I was present or not or 2) for the Diploma Support Team to stand in when I was travelling and for all of the time of the technology “devas” that I love so much to hold the structure together of the website, the mailing lists, the conference calls and much much more. What comes to mind with great love is a week I spent in France before we moved as a family. I came over with a friend to pick up the keys to the cottage and while I was here, I worked two of the evenings. My partner opened the call on his computer in the UK, the mailing list had automatically sent out invitations to Diploma participants with their link to join in and I – with great trust – dialled in from my mobile from my new living room – and for both meetings experienced crystal clear and undisturbed meeting times with them. It was just so easy and so magical and a wonderful sign to me that all was well. I encourage you to spend time over the next few days to reflect upon this year and before you say goodbye, write out a list of what you are grateful for. Whether your year has been amazing or challenging, grace and love can be found. If the above resonates with you and you’d like some support around manifesting the life your heart dreams of in 2016, then each month I offer a limited number of complimentary Magical Business Sessions. To apply for yours, click on the link below and I’ll be in touch within 48 hours.